This page is intended for the person who would like an introduction to the banjo and some of the differences among the types of banjos and banjo-playing that exist. There are links to some banjo pages, photographs, and some RealAudio sound files here. To hear the sound samples, you will need to download RealPlay, the free RealAudio player. If you find that any one of these links is no longer working, please let me know; TIA. Disclaimer: There are no definite rules here; everything I'm about to say is a generalization to which many exceptions occur. The most common types of banjos being played today are the 5-string, tenor, and plectrum banjos; there are not only physical differences among these instruments, and different ways of playing them, but the types of music for which they're used tend to be different, despite some notable overlaps. The most commonly played banjo in the United States is the 5-string banjo. Obviously, these banjos have five strings; what is not obvious from the name is that the 5th string is a shortened string that most commonly is attached on the side of the neck, as shown in the whole-banjo photo, below, left. 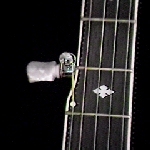 The close-up (below, right) shows a geared 5th string tuning machine protruding from the side of a neck. This string is usually tuned to the highest pitch, yet is adjacent to that tuned to the lowest pitch. The fifth string is not often fretted, and so it usually functions as a "drone" string: It is this drone that gives the 5-string its unique character. There are many tunings used for the 5-string banjo; on this website is a compilation documenting over 120 known tunings! Despite that huge number, the most commonly used tuning is an "Open G" tuning, in which the open--or unfretted--strings sound a G major chord: gDGBD (the indicated string order is 5,4,3,2,1-- left to right in the accompanying picture--and the lower case "g" indicates the short, 5th string's being tuned an octave higher than the 3rd string--the other "G"). You can hear this tuning, string-by-string, on Harrell Stiles's Banjo Page. There are many styles of 5-string banjo, and an almost equal number of uses for them. Bluegrass music commonly uses the 5-string (for many, it is the 5-string that defines bluegrass). The style of playing entails picking upward on the strings with the pick-covered middle- and index-finger tips and downward with the thumb, also bearing a pick. This "3-finger style" can be heard on The Banjos That Destroyed the World in this recording of Earl's Breakdown. A review of this and other albums (with many more soundbytes) can be found on the Cybergrass website, as can a lot of general bluegrass information. This finger-picking style can be used for many other styles of music, as well. Listen to David Crisler's recording of Charlie Parker's Ornithology. David plays this on an acoustic banjo, but he also plays an electric banjo, which can be heard on his recording of Kern & Hammerstein's All the Things You Are. For more information about jazz, rock and other modern music forms on the 5-string banjo, visit David's homepage. Many folks play Celtic music on the 5-string banjo. While he plays a mean bluegrass banjo, Chris Grotewohl also plays Celtic tunes in 3-finger style, which you can hear on his recording of Paddy Fahey's Jig. Visit his website for more sound files and to purchase his recordings and book. The 5-string banjo has been around longer than bluegrass and jazz, though, and was played in a much different style in the 19th century. There is resurgence in interest in that old banjo sound; listen to Mike Seeger playing a fretless banjo with gut strings as he plays and sings a Mississippi Delta Blues tune: Rolling and Tumbling Blues. More information about Mike's programs and recordings can be found on the Mike Seeger Website. Quite a few people today are interested in a style of playing the 5-string in which the strings are struck downward with a fingernail, the drone string being plucked with the (usually) naked thumb. This style, called "clawhammer" or "frailing" (or a host of other names; see "Is it Frailing or Clawhammer?" for more information) is more rhythmic than the three-finger style of bluegrass and is commonly used when playing Old Time music. Cathy Fink plays a very smooth clawhammer style on her recording of Banjo Song. You can hear more of her work and buy recordings at tunes.com. Dwight Diller has a unique approach to clawhammer; listen to him play Cluck Old Hen. There is a Dwight Diller website from which you can download tablature, hear more of Dwight's work, and buy recordings. Ken Perlman also plays Celtic music (among many other things) on the 5-string, but he plays it clawhammer style. Listen to him play MacDonald's Reel. More information about Ken and his performances, instructional materials, tune collections, and recordings can be found on his Homepage. There are many who play classical and baroque music on the banjo. Here's a transcription of the Allemande from the J.S. Bach Cello Suite #3, as played by Kim Nakae. Kim has other Baroque sound clips and music written out for them in banjo tablature* on the Bach For Banjo page of his website. The Tenor Banjo and the Plectrum Banjo are four-stringed instruments. The Plectrum Banjo has the same length neck as a typical 5-string, but--of course--doesn't have that weird, short, fifth string. The Tenor Banjo has a shorter neck than the Plectrum Banjo, and is usually tuned differently. A great deal of information about 4-string banjos, their uses and tunings may be found in the Four String Banjo FAQ which resides on Noel Induni's website. These banjos are most often picked or strummed with a flat pick (a "plectrum"). These are the banjos usually hear in Dixieland bands, jazz bands, the Mummers Parade, and, of course, much Celtic music. While there are many overlaps of style and music between tenor banjos and plectrum banjos, the former are typically used to provide rhythm, while the latter are often used for solo playing, as in this recording by the Banjo Kings of You Are My Sunshine. Melodies may also be played in a chord style, heard here in The Banjo Kings' recording of Jeanie with the Light Brown Hair. More of these soundbytes can be heard at tunes.com, and recordings can be purchased from that site. If you have questions that are not addressed here, please feel free to contact me, and I will either do my best to answer your question, or I'll pass it along to our over 1,100 BANJO-L subscribers for their consideration. FTM, you can always subscribe to BANJO-L yourself, and ask your question there; we'd love to have you! *Tablature is a form of musical notation much used for 5-string banjo music: Instead of showing which notes are to be played, it indicates where and how to play those notes, but does not tell what they are. Most of the music that has been published for the 5-string banjo music is written in tablature.